In the note business these days, it is not enough to just stand in a corner and wait for people to come to you. Now more than ever, you have to be creative. 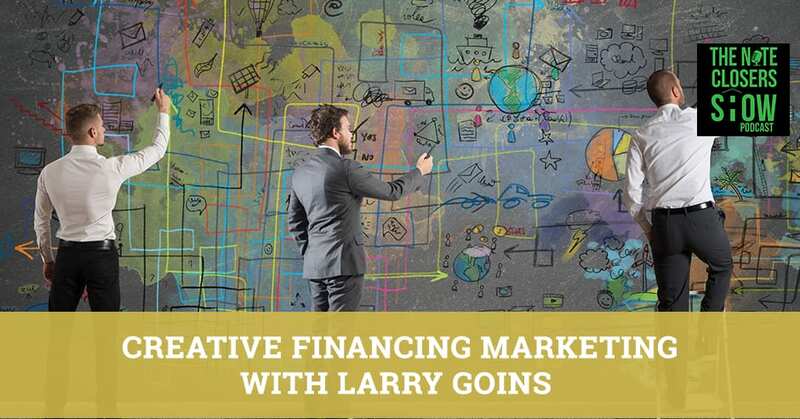 Scott talks with Larry Goins from the Goins Group about some of the creative financing strategies that Larry is doing with his deals in the Carolina market. They give out valuable advice to those that are looking to get into owner financing, filling the conversation with testimonials on attracting buyers and selling their house. Larry shares how he finds his buyers as well as how to reach out to them, whether through email or direct mail. He also gives his thoughts on where he sees the market going in the near future. We are honored to have Larry Goins join us from The Goins Group. I’m doing great. Larry, why don’t you introduce yourself for those out there who don’t know who the man, the myth, the legend is? I’m Larry Goins from Lake Wylie, South Carolina. I’ve been investing for many years. I bought my first house in 1986 right before many of you were born. I’ve done over 1,000 deals. I’ve done wholesaling, seller financing and lease options subject to short sales. I’m a private money and hard money lender. I’ve done residential, commercial, multifamily, and triple net lease properties. I’ve owned Dollar Generals and Shoney’s restaurants and mobile home parks. I stick to what I love, that’s wholesaling and seller-financing. Those are the two things I love. I’ve done deals in twelve different states right from my office in Lake Wylie, South Carolina. You love the Carolinas. That’s your home bread and butter area? I do the majority of my business here all over North and South Carolina. 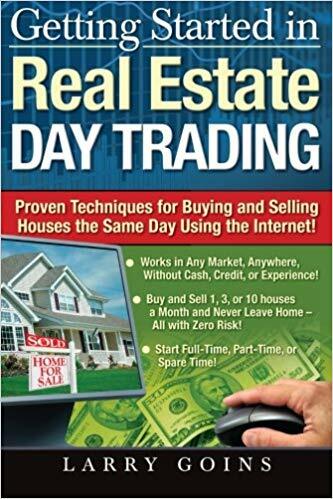 I’ve written a couple of books about the wholesaling called Getting Started in Real Estate Day Trading. I also buy a lot of HUD houses, HUD homes half off. We bought HUD houses as low as 20% of the list price. Most of our deals are in the Carolinas. Let’s talk a little about owner financing. Can you give some advice to those that are looking to get into owner financing? Any tips to attract buyers or tips for people out there that are having a difficult time selling their house conventionally. What are some tips to help them sell with owner financing? I have a model I called Filthy Riches and it’s all about buying cheap, low-price band properties and then you sell them for about three to six times what you paid for them with owner financing. I’ve had infinite returns. The deals I keep my money in, I’ve had returns as high as 788% return where the buyer put down almost all I had in the property. You mentioned some tips on finding buyers. Finding buyers is the easiest thing there is. They see an ad out that says, “Why rent when you can own? Payments less than rent. No bank-qualifying needed. Looking for a deserving family with a reasonable down payment.” We just sold a house. The seller financed 100% at 5% interest. No money down, twenty-year financing. No prepayment penalty and nonrecourse financing. He financed $82,000 so I bought the house for $82,000. No money down and I sold it for $99,900 and I got $18,000 down. You wrapped the owner-finance with another mortgage or you sold it traditionally? I sold it and let them assume my loan. I also got 90 days until the first payment. That’s not the typical deal. That’s combining wholesaling and seller-financing. I negotiated seller financing with my seller and then I sold it to a buyer and I collected the down payment. A lot of times I just sell or finance deals. I’ll buy it and pay cash and then I will sell or finance it and be the lender myself. We do a lot of marketing and we make the phone ring. We probably get 300 calls a week from motivated sellers. If I can’t meet their price, I always ask for terms. A lot of people get fixated on price. They’re willing to give you amazing terms below market stuff. I’ve negotiated three of those seller finance deals. Are you posting on Facebook to get the phone ringing? Are you doing it via mailers? Are you doing it via the classified ad in the paper? Where are you finding a lot of your buyers? Majority of it is direct mail. We mail out about 25,000 pieces a month and we break that up into four weekly mailings, which is 6,000 to 7,000 a week. The phone rings in our office and the leads go automatically into Podio. We have lead managers that will process that lead. I’m a small team. It’s not like I have five acquisition people, five salespeople. I’ve got one lead manager, one closing manager and one sales guy. I am the acquisition guy. I have now 28 deals under contract in our pipeline and I am the acquisition manager on all 28 of them. That’s why you know exactly the ins and outs of that, what’s going on and how to best structure it. I do them all over the phone. You’re not driving to look at all these properties? You’re dropping the postcards out, are these going to lower-priced homes? Where are you mailing the letters out? Have you got zip codes that you’re dropping postcards out to? We mail them in about seven different counties in North and South Carolina. I’m in the Charlotte MSA. I want to get out two or three counties out. I’m not right in the thick of all the other investors. It’s rare somebody tells me, “I get these postcards all the time,” because I’m mailing out to small town USA outside of the MSA. I also want to keep the values. I only mail out to people where the values are 100,000 or less. You’re marketing out that house to your buyers? You’re building a buyers list out there? We’re always building a buyers list. We’ve got a list of about ten or fifteen things that we do to market every single property. We’re going to put it on Facebook. We’re a member of all the Facebook groups in the Carolinas that have anything to do with real estate. We put it on Facebook Marketplace, on the buy and sell market groups on Facebook. We put it on Connected Investors. We put it on MyHouseDeals. We put it on Craigslist. We put them on our website. We send out emails and text messages to our buyers. We’re always building our buyers list. A lot of people don’t realize that there are many different Facebook groups out there in different areas of the country. There are many real estate investment clubs. With Houston alone, they have a lot of groups there when you jump on LinkedIn or other things. There are many ways to get the marketing out to an audience and then collecting their information. You do something smart where you can send them a text message with the details of it. You’ve bought in multiple states, but you like the Carolinas. North Carolina is a shorter foreclosure state, South Carolina’s a little bit longer foreclosure state. Are you running into issues with owner-finance notes? Did you ever have to foreclose or drag it out? Are you usually doing Cash for Keys to speed up the situation? I’ve been doing this for years and years. It’s probably been a few years since I’ve had to foreclose. I try to keep the relationship with my borrowers where they know upfront, we established this, “If you don’t pay, you can’t stay.” I’ll try to work with them. I’ve done loan modifications. I’ve helped them sell their houses before. I even had somebody a couple of years back that they put $10,000 down. I did a loan modification. They failed out of that. They finally said, “Larry, we’re going to have to leave,” but they brought me my next buyer. I was so good to them that they helped me sell the house to the next buyer. A lot of people out there want to do something big in 2019. They want to leave their job. They want to get started. What’s the best bit of advice that you can give somebody out there who’s looking to get started? It’s not much different than you or anybody else out there who’s going to tell people. Number one, you’ve got to get educated. Number two, you’ve got to take action. Education without action is irrelevant. You’ve got to take action. I had a group of some of my high-level students come to my office and they thought they were going to come here for me to train them. Stand in front of them and write on the whiteboard all day. They got their computers out and they got to work. They got busy. When they got home, their phone starts ringing off the hook as mine does. Too many people go to a workshop and they never take action. I know that frustrates you as it frustrates me. It used to bother me and I wanted to get out of educating people, but then I started realizing all the people that I am helping. All the way around my training room is lined with testimonials of students who have gone before our students. They’ve gone out there and done deals and made money. We put them up on the wall of fame and that’s a small percentage. I’ve got hundreds and hundreds of those students. People will email you and say, “Why don’t you give me your course and I’ll split my first deal with you?” The people who get it for free, it has no value to them so they do nothing with it. Where do you see the market going in the near future? Are you seeing slowing down their markets as far as values or days on market? Are you thinking we have a big price correction in different parts of the country? We’re already starting to see some slow down, even where you are. You’re starting to see the high-priced properties stay on the market longer periods of time. That’s already happening. I don’t think there’s going to be a crash like there was in ‘07, ‘08 and ‘09. There’s not going to be that crash because the lending is not crazy the way it was back then. The harbors and financing are back on subprimes or as they call the non-prime now. I had somebody call me who was like, “In bankruptcy, we’ll do foreclosure bailouts 100% financing with a 480 FICO. You’re in that market a lot better than I am so you would know. Maybe there is that coming. I hope it’s at least a couple more years until it hits. I’m a firm believer in buying value. I don’t care if the market is here or it’s here. If it’s here, I’m buying here. If it’s here, I’m buying here. It doesn’t matter. Plus, the second part of that is I’m buying in the low-price band. I’ll buy a house for $5,000. I’ll buy a house for $10,000, for $20,000, for $30,000. Most of my houses I’m selling for $15,000, for $29,900, for $39,900, $49,900. Those price values aren’t affected by the market. A $30,000 house is always going to be a $30,000 house. It’s just some of them I buy for $10,000. Creative Financing: Volatility happens when everybody’s fighting and slicing their grandmother’s throat to buy a house. That’s what people think especially in those price points too. It’s easier for somebody to cash out or they’ll stick around and ride it through the downturn. 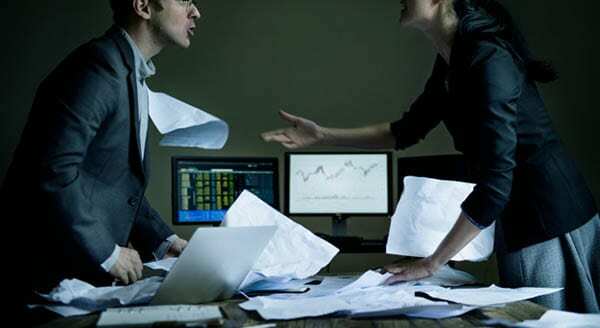 Volatility happens in the higher valued areas or the crazy areas where everybody’s fighting and slicing their grandmother’s throat to buy a house. It’s the median price and above. I don’t even get there. I stay under $100,000. If I’m wholesaling a property, most of the time I’m wholesaling it for $15,000, $29,000, $39,000, $49,000, $59,000. If I’m seller financing it, I’m buying it for $10,000 and seller-financing it for $29,900 or $39,900 or I’m buying it for $30,000 and I’m seller financing it for $69,900 or $79,900. Are you still doing a little bit where you’re bringing in IRA investors to help cash out your profits and still staying involved with your arbitraging your funds, giving them a good return on investment? I do that a little, not much. I only do it with my kids ESA and my HSA because those are still small accounts and we’re building them up. I do that only on those small accounts, but we have ESAs, HSAs. I’ve got a Roth, my wife has a Roth. 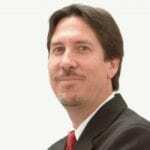 I have a solo 401(k) or Safe Harbor 401(k). Plus, we have the LLCs that we do business in. My goal is within a few years, I want to be doing all my business in a self-directed type of account. As you grow those accounts, you’d be able to do more and more and be able then to do bigger things. That’s still not stopping you from taking the opportunity to put those accounts to work. A lot of people like to start an account, but they don’t focus on putting those accounts to work whether it’s a small account or a big account. There are multiple ways to put that money to work. You could do all different kinds of transactions. You can do the transaction where I bought it for $82,000 no money down and I sold it for $99,900. I could have put my kids ESA or HSA in that deal with $500 or $1,000 and then wrapped it and collected a payment. I like to just make $18,000 and cash out. I did a deal in my kids ESA where I made $10,000. With the ESA, it’s use it or lose it. You got to use it that year. It’s not an HSA where you can carry it over and get refunded or get reimbursed for medical expenses a few years later. It’s not that way with an ESA so I wanted to go ahead and turn a deal and get the money out. If you put the money back in, it’s good for another year then at that point. You’re not using your accounts there. Are you using other people’s money to help you take some deals down as well? What we’re doing is we’re wholesaling properties and then taking some of those funds and it’s like, “Sell one, keep one. Sell two, keep one. Sell three, keep one.” Plus, we do a lot of hard money lending ourselves so we’re not using a lot of private investors’ money. I probably should, but we’re not doing that. We’ve been doing lending long enough. We used to do broker loans. We used to use other people’s money and we would make hard money loans. We would get the points and they would get the interest. Fortunately, we’ve got to the position where we loan out our own money. That’s where everyone gets to be the bank. Do you see opportunity as people come to the end of the year? Does your business pick up the end of the year, first quarter as people are moving or looking to change things? Does it slow down a little bit on the holidays? A lot of people are focused on the holidays, Thanksgiving, Christmas. There’s not near as many people that want to move. I would suggest keep your marketing up, but don’t market to owner-occupied buyers. Market to the vacant property owners, code violation and foreclosure as long as they’re not owner occupant. The owner-occupant people don’t want to move during the holidays. A lot of banks will even let people slide a little bit until January. Get past the holidays and then they’ll foreclose on them. I had a guy on the phone and he said, “Can I get my money before Christmas?” People are motivated this time of year. They want to get their money right away. I do the same strategy as Larry did. It works tremendously. For those investors out there, people that are in the higher end of the markets. Let’s say they’re in higher price aspect of things. Any advice? You talked about going out a couple of counties. I know a lot of people are scared initially about investing outside of their backyard and we tell them the entire time, “It’s not that hard. Get a realtor. Get somebody to drive by.” What are some tips for overcoming those fears of investing on outside their backyard that you’d like to pass on? There are many tools that people could use. You don’t have to worry about going outside your own market. I’ve got many students. Some of my most successful students live on the West Coast where the prices look like phone numbers. They invest in the Midwest or in the Southeast or in the Northeast and they’re buying the lower price stuff. Number one, the lower priced stuff is not as intimidating. Number two, you can get anything you want on the internet. All you’ve got to do is ask Google and Google knows everything. I’ve got this thing down to a science. Let’s say right now it’s 10:00 Eastern, 9:30 your time. I get somebody on the phone and they agreed to accept my offer. Let’s say it’s $15,000. I don’t care if the house is in Shelby, North Carolina but they live in Dubuque, Iowa. It doesn’t make any difference. I’m going to tell them, “You live in Dubuque, Iowa? I’ve got somebody who’s going to be in your area in a couple of hours. Do you mind if I have them swing by and get the paperwork started so I can get you your money before Christmas? What’s your home address?” I’ve got a mobile notary service. It doesn’t have to be a notary, but I’ve got a mobile notary service that has a network of notaries all around the country. They can be at any house anywhere in the United States within two hours. I’ll set an appointment at 1:00 this afternoon. I have a special marketing number programmed into my phone. It’s for the mobile notary to use. I give specific instructions. If you don’t get the contract signed for any reason, you call me while you’re still at the house, while you’re still in front of the seller. My phone rings, it pops up and says, “Mobile notary,” and I know to answer it. I might have to reclose or we’ll answer some questions over the phone so they can get the signature. The mobile notary aspect of things is a huge win. Getting the paperwork started on your terms, not on somebody else’s term, “I’ll get to it tonight or I’ll get to it this Friday.” It speeds up the closing time of your transactions. We use that with our distressed note business. We got a borrower, we’re talking on the phone trying to get it modified or trying to pick a plan. We’re starting on a mobile notary immediately to get them to fill out that paperwork and sign it back into us and even a lot of times collect the first check out there to get us started on things like that. We’ll mail that into the servicer to make collecting certified funds, get the thing signed. Otherwise, people are going to sit there and be lazy and not take action. Not only that, the other thing that happens is they end up talking to their parents, children, niece, nephew or uncle Bob who was an attorney and they ended up talking them out of it. They start getting advice instead of seeking counseling. What are some goals that you’ve got set for 2019? I know you like to set goals like everybody else out there. Do you have some goals for the New Year? I want to expand my team and bring in a select few people to help me with the day-to-day as far as acquisitions. I love getting on the phone. I love negotiating deals. I have a partner program and for my partners, I record all of my calls. The good calls I put in a Dropbox folder so they can listen to them and they could hear me on the phone negotiating deals. I want to get to the port where I bring in a couple of other people and have them acquiring deals as well. We’ve got 28 deals and I did every single one of them, but there are only so many hours in the day. I want to take a little bit of time off and do some other stuff and travel a little bit more. I love real estate. I love being right in the thick of things. I’m not traveling much anymore. The Metro Atlanta REIA in Charlotte, North Carolina was the first speaking gig I ever had back in 2003. It was because I was the president back then. It was my first speaking gig and it’s going to be my last speaking gig at an REIA group. I will still do a few conventions and expos and go to some friends’ events. As far as REIA groups, it’s over. I’m done. You and I have both been road warriors and looking to get off the road. You also have a podcast too that you do on a pretty regular basis. Let’s talk about the podcast as well. I have two podcasts I do. The first one is called Brain Pick a Pro and it’s a podcast where I interview other people like you. I have a different person every single week. You get a diverse audience, you get a diverse set of topics, but the whole premise of that one is to interview other people. I have another show called BRAG. Be Rich and Generous is what BRAG stands for. Candice and I are on it every single week. We have a deal of the week. We’re doing enough deals, we’ve got a deal of the week. We have show sponsor winners and we give away courses and we have a topic of the week. We also talk about how people can go out and be generous and help others because our goal is to teach people how to invest in real estate and then go out and be rich and generous and help others. 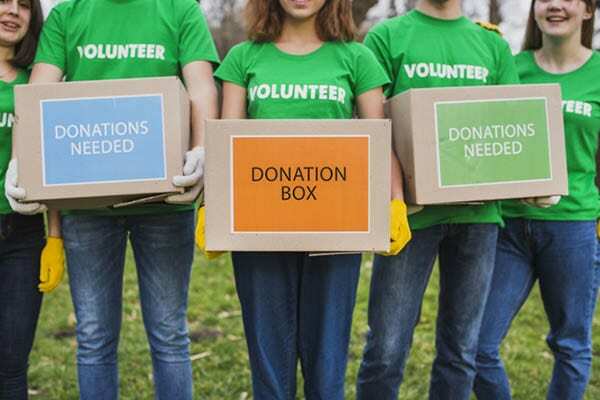 Creative Financing: Everybody can donate a little bit of extra money or extra toys on the holidays, but if you’re doing something on a regular basis, it adds so much more meaning to what we do. It’s important to be doing that year-round. A lot of people love doing something on the holidays. If we did it every year, every month, every week out there, you’d be much more generous but it adds something when you have a cause behind what you’re doing. Everybody can donate a little bit of extra money or extra toys on the holidays, but if you’re doing something on a regular basis, it adds so much more meaning to what we do. What’s the best way for people to get ahold of you, Larry? Find out more about Mr. Larry Goins and what you got going on. Our website is LarryGoins.com or they could call toll free at 877-LARRY-GO. Thank you for being a guest on the show. You’ve shared some great nuggets. I love what you’re doing. It’s always great to catch up with you. I’m glad to catch up with you and we’ll see you around. Check out Larry. You can get some great nuggets there for those that are looking to dive in, take some action or some things to help speed up your transactions as well. Go out and make something happen. We’ll see you all at the top. Larry H. Goins has been investing in Real Estate for over 20 years. In the past, Larry has served as President (2003 & 2004) of the Metrolina Real Estate Investors Association in Charlotte NC, a not-for-profit organization that has over 350 members and is the local chapter of the National Real Estate Investors Association. 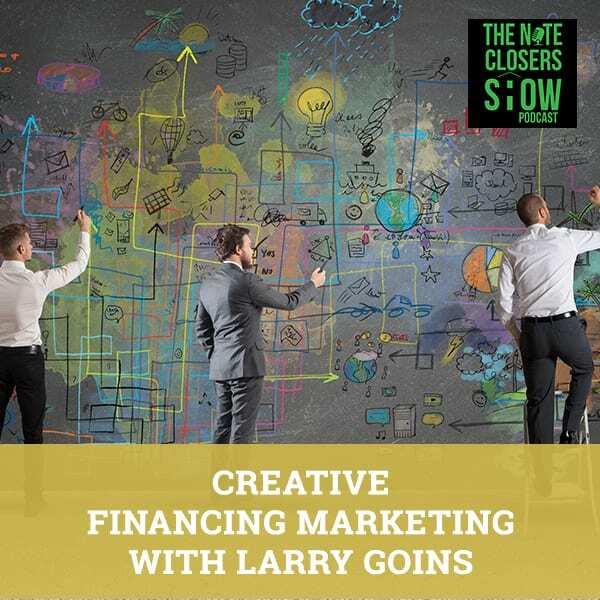 Larry is an active real estate investor and travels the US speaking and training audiences at conventions, expos and Real Estate Investment Associations on his strategies for buying 10-15 properties per month without ever leaving his office.